Anthony Cabot and Ngai Pindell, editors. Regulating Internet Gaming: Challenges and Opportunities. Las Vegas: UNLV Gaming Press, 2013. Internet gaming sparks controversy from corporate board rooms to legislative hallways. Unlike traditional casinos, the Internet permits people to engage in gaming activities from virtually anywhere over computers and mobile devices. Governments and policy makers looking at this activity struggle with such questions as whether regulation can assure that Internet gaming can be restricted to adults, the games offered are fair and honest, and players will be paid if they win. 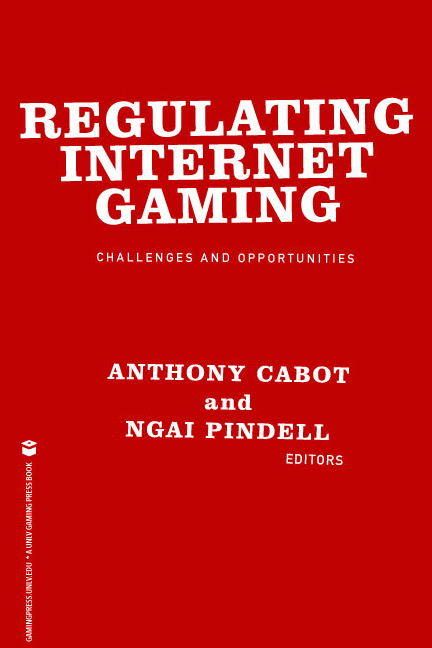 This book is a timely collection of eleven chapters discussing key considerations and model approaches to internet gaming regulation and outlining the important questions and emerging answers to regulating gaming activity outside of land-based casinos. Some of the regulatory insights are taken from lessons learned in the land-based casino industry and others from the relatively newer experiences of international internet gaming providers. Contributors are among the world’s leading experts on Internet gaming. They focus on structural concerns including record-keeping, managing different taxing regimes, maintaining effective controls, protecting customer funds, and preventing money laundering, as well as on policy concerns ensuring responsible play, the detection of fraud, reliable age verification, and the enforcement of gaming laws and norms across jurisdictions. 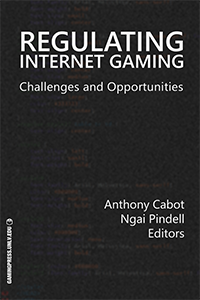 Internet gaming is an emerging field, especially in the U.S., and the contributors to this book provide regulatory examples and lessons that will be helpful to lawyers, policy makers, gaming operators and others interested in this burgeoning industry. The book also features an index and table of cases. If you are ordering for a library or academic institution, you can get the book through Baker & Taylor using ISBN 978-1490972992.